Anyone with a rudimentary understanding of New York City real estate knows that even the most "average" apartments in TV shows and movies are tremendously unrealistic. But just how unbelievable is it to think Carrie Bradshaw or the Friends crew could afford primo pads in the heart of the West Village? To find out, I enlisted the expertise of Kane Manera, an in-the-know luxury property agent at New York's Douglas Elliman Real Estate (and, incidentally, a former Guiding Light star himself), to weigh in on the real-world current value of New York City’s most famous fictional homes. The apartment: "The property that every kid wants when they grow up is still pretty cool—13 foot-high ceilings which are perfect for trampolines and original SoHo cast iron features. The fourth floor, one bedroom, 1.5 bathroom sold earlier this year for $2.3 million." The building: "There are 43 units in the building. If we assume Blair has the Park-facing Penthouse, we know it’s worth $35 million. It just sold for that amount." The building: "Great block, but that same New York story of compromising size for location. Here the compromise extends to the converted townhouse that Carrie calls home. I can’t imagine it’s comfortable without an elevator and wearing high heels so often, but you can’t expect much for $700 per month in one of the United States wealthiest zip codes. The façade in the show was actually at 64 Perry Street, which my team sold last year for $13.25 million. The interior needed to be gutted entirely." The apartment: "Great flow, huge closet and a floor plan that is well proportioned. From memory, Carrie was on a high floor, and what is rarely considered is that the ceiling heights generally get lower in NYC townhouses, so one can assume that if Carrie is comfortable living there, she is short. NYC studios (bedroom and living room combined) are generally between 400 and 700 square feet. This looks to be on the larger side." The building: "10 St. Luke’s Place in the West Village is actually the façade that was used for The Cosby Show. That property was recently sold for just south of $11 million. The row of townhouses on that block actually had some entertainment industry pedigree, with Robert De Niro previously owning and living in 14 St. Luke’s, and Arthur Laurents (who wrote West Side Story), living on 9 St. Luke’s." The apartment: "Beautiful architecture and over 5,000 square feet of space. Over 12 foot-high ceilings on the parlor floor, 22-feet-wide (20 is considered wide in NYC), multiple fireplaces, substantial garden in the rear and unobstructed views and light to the south: a real gem. Dr. Cosby had a great broker and eye for real estate." The building: "Busy intersection between the Park, 5th Avenue and 79th Street, but beautiful limestone mansions. A few doors east of Ralph Lauren’s flagship store, known as 'The Mansion'." The apartment: "The closest property presently available for sale for anyone wishing to mimic the lifestyle is 12 East 79th Street." The building: "The location is prime and pre-war architecture is always coveted, but your building is over Little Owl. Great food, but typically property owners in NYC don’t like the thought of having a restaurant in their ground floor space. It probably cuts monthly costs down in the building, but loud patrons, late operating hours, and the vermin associated will make it a tough sell. A few violations for no heat that are still open... I could see Joey getting cozy with Monica and Chandler to start a new story line." The apartments: "Monica and Rachel get more light through the Western windows, but it’s basically confined to their bedrooms. That said, the double wide northern window and what looks like a second means of egress, rather than an awesome terrace, would definitely give the home a more open feeling than many comparable pre-wars of this size and type. When you weigh them both up, a buyer would complain about the lack of closets and exposure, however that location and the efficient two bedroom layout would more than compensate for any complaints." The building: "Pre-war boutique building (only 20 units). Walk up, common laundry, no doorman, located off Columbus Avenue. If my memory of Seinfeld is correct, there is definitely a discrepancy between the real NYC building and the large elevator and doorman building in the show [Ed's note: there was no doorman in Seinfeld's apt]. Great street with little traffic, given the cars can go east or west if turning off Amsterdam Avenue, which is rare in NYC considering odd street numbers go west, even street numbers go east." The apartment: "Nicely proportioned one bedroom home, which includes home office, open kitchen (a rarity in pre-war one bedrooms), and enough space for living and dining. It is almost like this apartment layout is perfect for a TV show with its numerous sight lines and open loft-like interior. Don’t bank on the bathroom and bedroom windows looking into anything other than the building’s interior, but the large western window more than makes up for it…you almost wonder how a pre-war in a landmarked district can have such expansive windows." The building: "Built in 1983, nothing was cooler than the St. James. Still boasting views that would make anyone feel like winning, the 103 units in this sleek black skyscraper (reminiscent of Olympic Tower) is a full service building." The apartment: "If Bud’s apartment was on the top floor, he’d be feeling good. A river-facing five bedroom duplex on the 27th and 28th floors just sold for $6.99 million." "Average active sales are asking $3,222 per square foot, which is market standard for Park-facing luxury residential real estate amongst the Central Park West co-ops." The apartment: "Hard to say what the exact Rosemary’s Baby apartment would reach on the market, but for Lauren Bacall’s three bedroom home they're currently asking $26 million." The building: "Beautiful pre-war on an exceptional block." The apartment: "Jack’s is a spacious cave with a tiny bedroom. It’s incredible to think that the bathroom looks to have more square footage than the bedroom, but in studios which are converted to one bedrooms by using the “dressing room” as the bed space, this is completely plausible. It's also odd to think that the only windowed portion of the property was the dressing room, and this is not a loft, but an architecturally designed residence. I think it's proof that this is one of those impractical Hollywood floorplans. Will and Grace’s is much more gracious and conventional, albeit annoying for the second bedroom to cross the living room in order to use the bathroom." The building: Its second mention on this list, The Dakota was also home to Vanilla Sky's main character, David Aames (Tom Cruise). 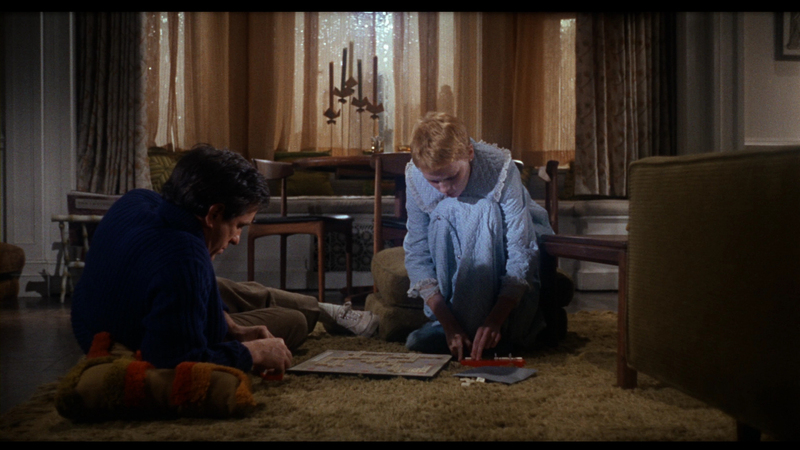 The apartment: "I think Tom Cruise had a nicer apartment than Mia Farrow’s in this Henry J. Hardenbergh masterpiece." The building: "Interestingly the building is a walk up co-op, which is relatively common on the Upper West Side. I recently sold a property that was almost identical in criteria (two bedrooms, large living room, open kitchen, good condition, modern appliances) a few blocks north of Ted’s building for $1,390,000.00. I’d say if Ted asked $1,450,000.00, I’d be confident he would be putting that in his bank." The apartment: "If Ted had ensuite bathrooms and less of a 'man cave' in the common space, one may actually believe this was designed by a qualified architect." The building: "The American Felt Building at 114 East 13th Street once supplied the hammer and brushing felt to Steinway pianos. Converted from a loft building to residences in the mid 1980s, the full service building set the precursor to much of what is considered desirable in downtown New York real estate today: high ceilings, large windows, having a raw loft character, many apartments having terraces. If Bret Easton Ellis had this as his setting and used it to inform Patrick Bateman’s less socially sophisticated scene of business and ego on a more bucolic Upper West Side in the 80’s, then the fictional American Gardens Building could well be a condo like the Pythian at 135 West 70th Street. The Pythian’s location has more action than 81st Street, however the richly decorated old movie palace, with its decorative features, inlaid by the 1980’s minimally ornate and hefty glass and steel when the building was converted to residences is the perfect reflection of the Old World/New World Bateman in my opinion." The apartment: "All these desirable features were packaged in a friendly condo style that attracted highly recognizable residents, looking to be as close as possible to the artistic World of downtown New York, without compromising the comfort of a luxury home." The building: "16 Mercer was originally built in 1863 to shelter Union soldiers returning from the Civil War. Today, it’s a boutique rental building with mint-finished interiors and all the authentic loft features one expects in SoHo—exposed beams, large windows overlooking cobblestone streets, high ceilings (12 ft). The prices, however, are affordable by prime downtown New York standards for two reasons: 1) the building has no luxury amenities (no doorman, gym etc.) and 2) the location is closer to Canal Street than ideally preferred. These two features aside, you have some wonderful properties that include a four bedroom on the fourth floor which was recently rented out for just under $24,000 per month (approximately $80 per ft). Another building, located north of 16 Mercer, and including full “white glove” service could command over $130 per square foot, if price comparison is of interest. But to the Big Daddy/Adam Sandler in all of us, why pay the extra for something fancy when you get the essentials for less." The apartment: While 16 Mercer does have floor-through, 3,000+ square foot apartments, they are not the multistory fun house that's portrayed in Sandler’s Razzie-winning film. I would suggest 74 or 78 Grand Street as more accurate interpretations of reality. Renting slightly over $6,000 per month for 2,000 square feet, or available for purchase at around $2.5 million per floor for raw, Artist-In-Residence zoned space, these buildings retain original charm and deliver size for the best possible price. Seeing as Sandler works as a toll booth agent, living off $200,000.00 in accident compensation, I doubt he’d be spending that on less than a year’s rent at the real 16 Mercer." Joe McGauley is a senior editor at Supercompressor and even if he could afford to, would never live in The Dakota. Thanks, Roman Polanski.